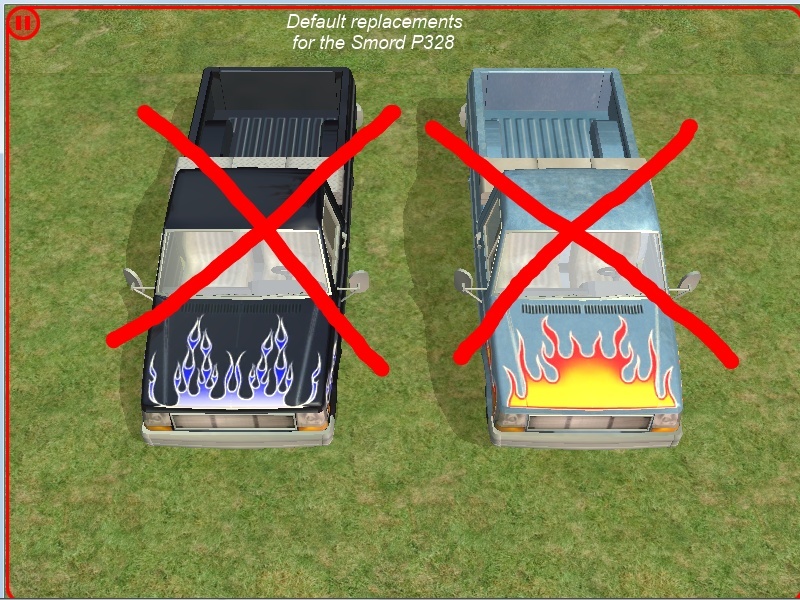 This is a set of texture replacements for the Smord P328, the pickup truck from Nightlife. It is divided into multiple sets, and each set is in its own rar file. The solid black and solid white pickups are not replaced. The light blue replacement is from simdebster's Smoogo Blue set, and the dark red replacement is from her Antique Red set. The darker blue, green, and brown replacements are mine, and the one with stripes was edited by me. 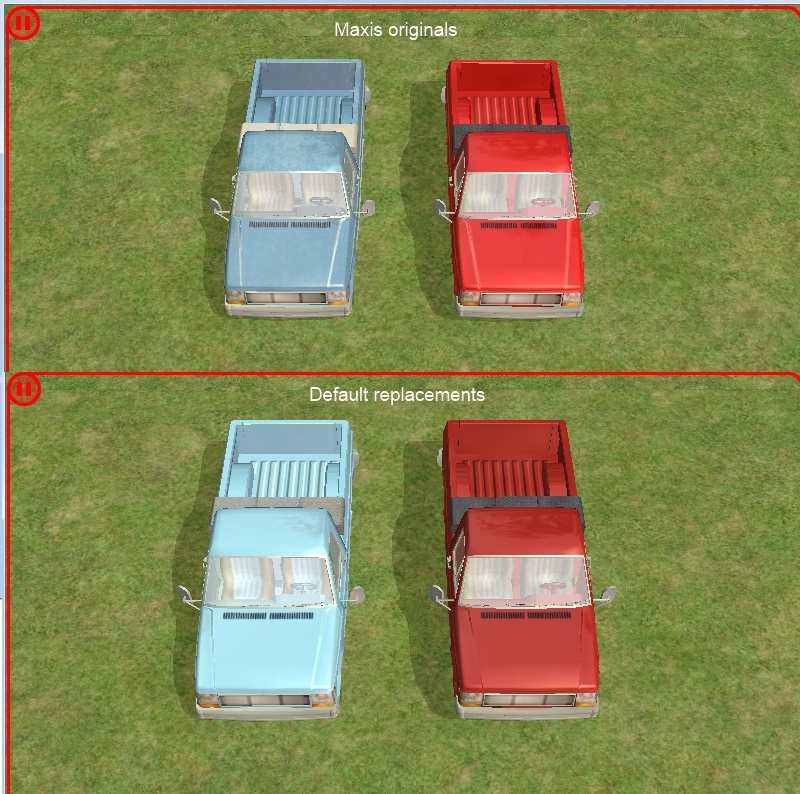 All other replacement textures are from Michelle's set of car recolors. 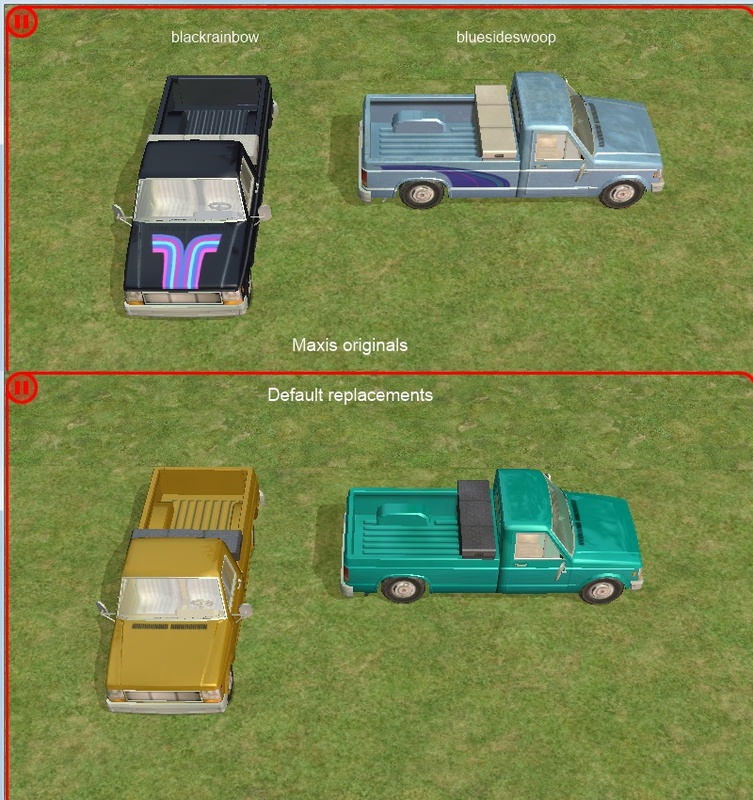 I have added lod90 textures, as I understand that they may affect how the cars appear in the neighborhood view. All textures are compressed with SimPE. Note: The Smord P328, unlike the other Nightlife cars, only has one recolorable subset. Because of this, the Buy Mode preview for a replaced pickup will show the Maxis texture unless you use Ctrl-right click to refresh its catalog thumbnail. I do not know if there is any Mac equivalent of this. First, here's the replacement for the flaming paint jobs. The blue is mine, based on Michelle's LACK blue, and the other replacement color is simdebster's Antique Red. Click the button to see a before-and-after pic. 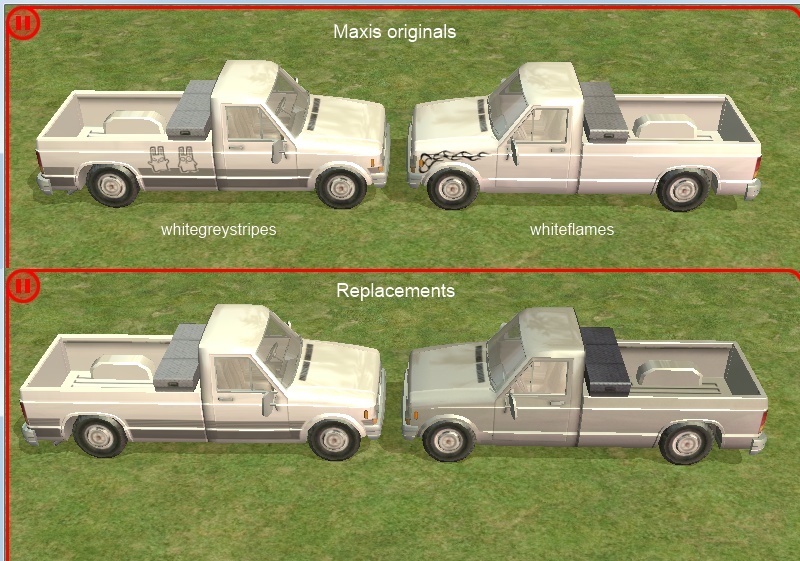 Next, the white pickups with "line art" are replaced. (I don't know if that's the right term, but I can't think of a better one.) To replace "whitegreystripes", I just edited out the "freezer bunny" outlines. The "whiteflames" design is replaced with Michelle's silver. Each replacement is in a separate package file. The next set replaces the four pickups that basically have one-off designs. Each replacement is in a separate package file, and the rar includes pictures so you can choose which designs you want to replace. The replacement textures are Michelle's yellow and turquoise, and my green and brown. Finally, a replacement for the Maxis solid blue and solid red, using simdebster's Smoogo Blue and Michelle's red. Again, each replacement is in a separate package file. This may affect the blue pickup truck that appears in neighborhood-view traffic. 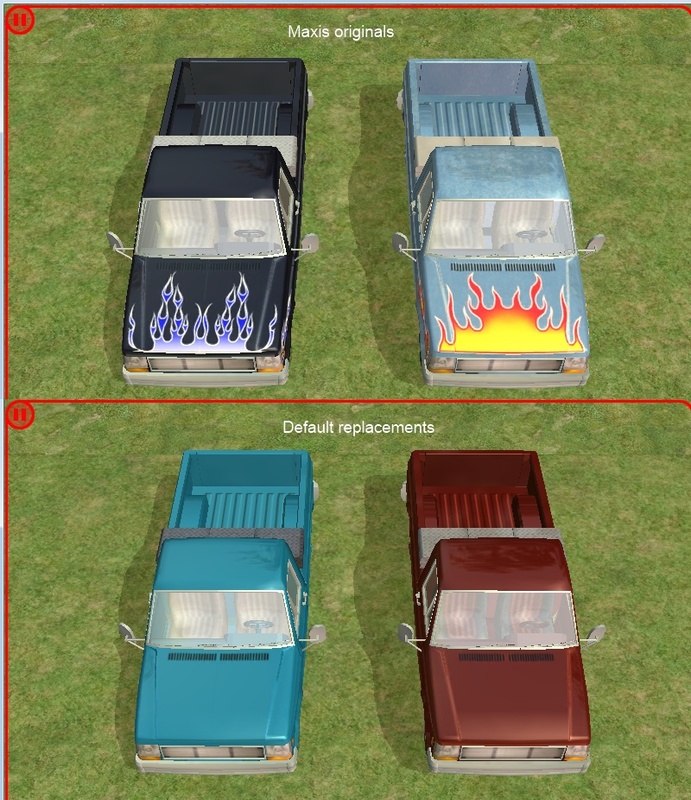 The repairman's truck should not be affected, as it uses a separate texture. 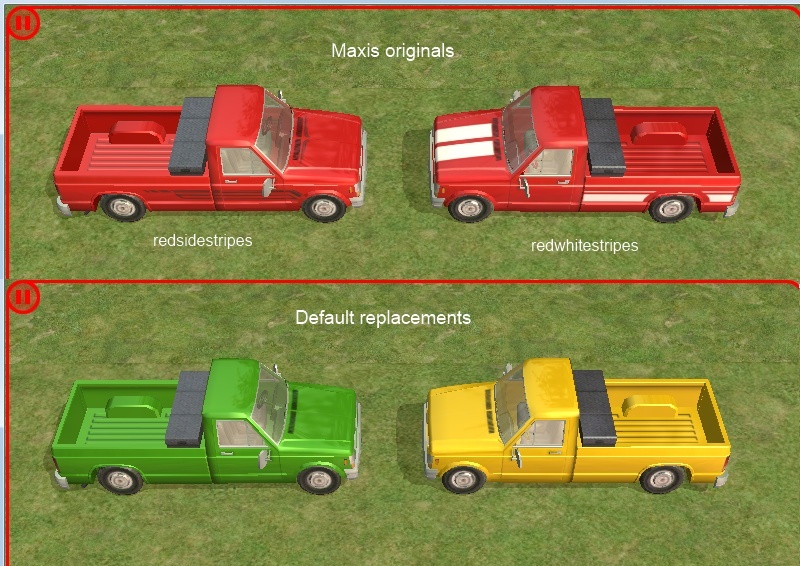 February 29, 2016: Non-default versions of the green, brown, and darker blue recolors and the replacement for "whitegreystripes" are available in this thread.